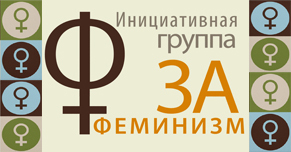 blog of the Russian activist group Za Feminizm (Pro Feminism) which fights for and supports campaigns for women's rights, equality, reproductive health, against violence against women, against sexism in media/advertising, the Russian orthodox church and society, against fascism and racism etc. self-description: "The Activist Group "Pro feminism" brings together people of different political views. Our goal - promoting feminism, which involves the fight against patriarchy for achieving gender equality and to eradicate discrimination against women in all spheres of life. We believe that gender discrimination can only be tackled together, breaking down barriers between different political forces." The group also awards the "Sexist of the Year award" and maintains a very active community-livejournal-page; some articles of the blog are written in English, otherwise in Russian; emphasis on feminist news and activism, women's rights and equality, anti-facism/antiracism, sexism in media/advertising, religion/sexism in the Russian Orthodox Church, violence against women, reproductive health etc.